Recently, while I was bored at work, I read through the 27 week Scraproom organization class. Two weeks later, I created a lo in about 2 hours! It was taking me days before. I'd have to find things and I'd get sidetracked. Now I can just turn in circles in my chair for the most part and have everything I need at my fingertips! My biggest problem is that I had too much stuff. Stuff that was pretty but I'd never use. I only scrapbook with a few key items and now they are the center of my scrap room! If you feel like 27 weeks worth of stuff is too much to read through or deal with, there are sections that may not apply that you can skip. I was able to skip about 7 sections since I don't have stamps, punches or a few other items they talk about. I also don't go to crops so that skipped a week. Also, there were some things I already had organized such as pictures and photo albums. Another thing I (and the class) would recommend is definitely not buying anything until you get towards the end and see what you already have. I started making a list of organizational items to buy but by the time I got to the end, I discovered storage I already had around the house. How goooooooooooooooooorgeous! and this is my 2nd comment!!!! LOl! Awesome! That's great. I took the class and got discouraged. I have so much stuff and a small room that is opened to the front door of our house so everything has to be put away not out in the open for the most part. I managed to do some of it however but still since I have to put things away it is hard to get to everything so I avoid some things like stamps and punches unless I deliberately say I am going to work with those things and take them out first when I get ready to scrap. Love your room. And a chair to relax in too? Awesome!!! You did a beautiful job organizing your scrap space! I love your work surface and that it is in the middle of the room that you craft in...love it! What a wonderful space you've created! Wow, this is awesome! I'd love to be organized like this, it's just going to take me sometime, since we've only been here 3 months July 7! Congrats to you !!! Awesome room! It looks amazing!!! You did a wonderful job! I want a space like this! Your so LUCKY to have it! Wonderful space!! So happy for you! 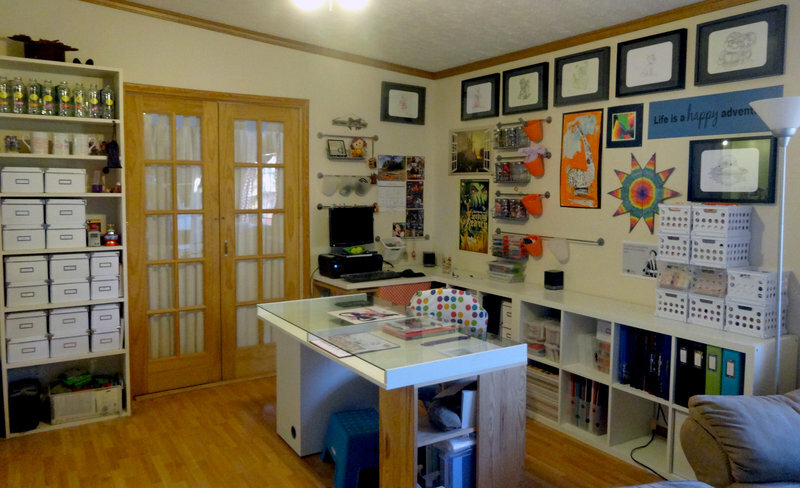 OH my goodness, your studio is absolutely perfect! WOW I totally love your desk area with the glass on top, awesome! !